MommyDigger.com’s giveaway sponsors are Shark and EdenPURE! I love my Shark vacuums! They are affordable and they do an amazing job cleaning my home. 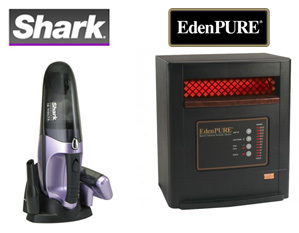 I own a Shark Navigator and recently added the Shark Pet Perfect II Handheld Vacuum to my arsenal of cleaning supplies. I love my Shark Pet Perfect II, it makes cleaning up a mess or touching up around the house so much easier and it’s perfect for my stairs and the cars! Check out my full review of the Pet Perfect II Handheld Cordless Vacuum. What’s even better is Shark is giving one of my lucky readers a Shark Pet Perfect II handheld vacuum (retail value $79.99) for this event! EdenPURE heaters are kid and pet friendly plus they will help you cut down on your heating costs this winter! They don’t look at all like a typical space heater and have burled wood accents that help them tie into your homes decor. Check out my full review of the EdenPURE Personal US Heater. EdenPURE is giving one of my lucky readers a EdenPURE Personal US heater (retail value $197) for this event! Shark is giving away a Shark Pet Perfect II Handheld Cordless Vacuum (RV $79.99) to one lucky reader! EdenPURE is giving away an EdenPURE Personal Heater (RV $197) to one lucky reader! To enter fill out the Rafflecopter form below and follow the instructions. The giveaway ends on November 25, 2011 at 11:59 pm EST. The winners will be selected at random and have 48 hours to reply back before a new winner is selected. Good luck! 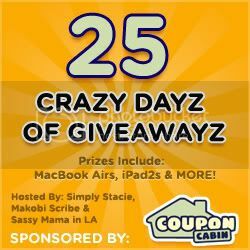 Enter the other blogs’ giveaways in the CouponCabin’s 25 Crazy Dayz of Giveawayz by visiting the links below! I love the shark, perfect for our new puppy! I would love the EdenPure for our very cold basement room! I’d love to win the Shark Pet Perfect II Handheld Cordless Vacuum. It would be perfect for us! Our dog sheds like crazy and it would be nice to have a handheld to do touch ups on the furniture without having to drag out the entire vacuum. I need the Shark to clean up after my son without having to terrify him with the vacuum! I’d be happy with either. But currently we’re living in a basement. The room my two youngkids share does not have a heating duct and it’s very coldin there. With winter setting in, we really need a heater!